Anthony Crolla (32-6-3, 13 KOs) got back on the winning track on Saturday in beating Ricky Burns (41-7-1, 14 KOs) by a 12 round unanimous decision in a fight that was a lot closer than the scorecards handed down by the 3 judges at the Manchester Arena in Manchester, England. Fighting in front of his boxing fans at home, Crolla got the nod on the scorecards by the scores 116-113, 117-112, and 116-114. Burns fought well in using his height and reach to land jabs from the distance in the earl round. Crolla, 30, took the fight to the inside as much as possible, landing well with body shots and hooks to the head. Crolla was the busier fighter, but he also wasted a lot of shots by not getting a lot of power behind them. It looked at times like Crolla was just being busy for the sake of being busy to impress the judges rather than doing meaningful work. Crolla faded a bit in the last 4 rounds, and that’s when Burns appeared to even the fight out or at least he arguably should have evened it out. Burns landed some nice shots in rounds 9-12. Crolla looked exhausted from the fast pace that he had set in the fight. Burns landed the far better punches in the championship rounds, but he failed to get the nod with the judges. Crolla might have lost the fight tonight if it had taken place in Glasgow. As far as Crolla fighting for a world title, it’s unknown who that would be against. Crolla vs. Jorge Linares would be too much. They’ve already fought each other 2 times, and it’s academic at this point that Linares is way too good for Crolla. It would be punishment for Crolla’s boxing fans to see him fight Linares yet again. Crolla needs to try someone new like WBC champion Mikey Garcia or WBO champion Terry Flanagan. This was far from a decisive victory for the 30-year-old Crolla. It could have gone either way. While Crolla outworked and out-landed Burns, his punches didn’t land with the same authority as the Scottish fighter. The results weren’t surprising, given that Crolla was fighting in front of his home fans, but it’s a fight that probably would have been scored a lot differently if it had taken place in a neutral venue rather than in Crolla’s backyard. The good news is the fight was close enough for there to be a rematch between the 2 fighters one of these days if they want to face each other again and if their promoter Eddie Hearn would like to put together a second fight. More likely than not, Crolla will move on and try and get a world title fight against Jorge Linares or Terry Flanagan. Those would be the best options for Crolla. WBC champion Mikey Garcia and IBF champion Robert Easter Jr. wouldn’t be a good option. Easter Jr. hits too hard and he’s very tall. Burns is almost as tall as Easter, but he doesn’t have his punching power or his youth. In the co-feature bout, Mohamed Mimoune (19-2, 2 KOs) defeated EBU welterweight champion Sam Eggington (24-4, 13 KOs) by a 12 round split decision. 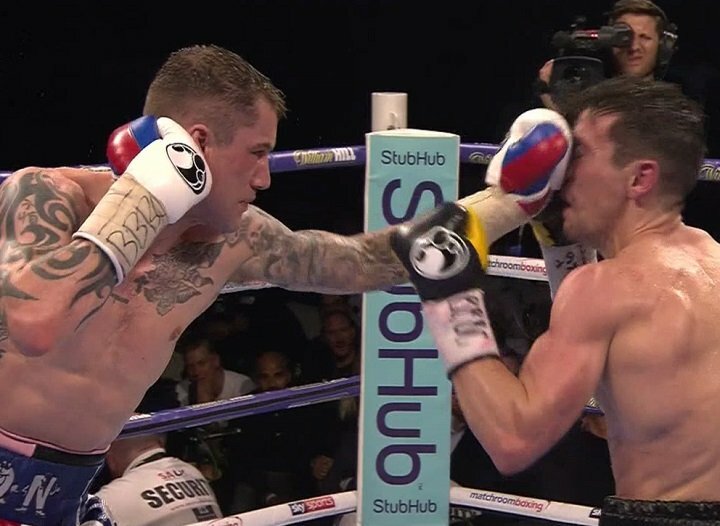 The final judges’ scores were 116-112, 115-113 for Mimoune, and 116-112 for Eggington.